"Just one-third of children in families below the poverty threshold are read to daily. That statistic improves as family income rises. But less than two-thirds of children in families making $95,400 for a family of four are read to daily, according to the 2011-2012 National Survey of Children's Health. As a result, children in poorer families lag behind in language processing as early as 18 months of age, a study published last year in Developmental Science found." I'm really passionate about reading to my son. Most of my childhood memories are about books. My mom gave me a love of reading by taking me to the library multiple times a week in the summer. I devoured books so much that when I misbehaved and couldn't watch TV for a week, I wasn't too disappointed because I had books. So reading is something that you can create a positive association with early on. So many older kids say they hate reading, but you can teach them to love reading early on. The more you read, the better of a writer and a learner and a speaker you are. 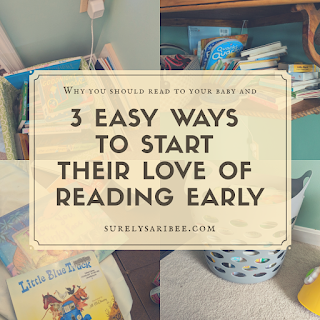 Here's some ways I am fostering a love of reading in a baby under a year old. At nine months old, I had read my son more than 200 books. That doesn't count the books at daycare, either! I took my son to a library story time on a weekend morning once when he was about three months old. I know he heard the story as he laid on the floor but there wasn't much else. Once he was seven or eight months old and could sit up and bounce up and down excitedly to the songs and the dances and watch the librarian read, it got a lot more fun. I can tell he LOVES it and I'm excited to see him interact with the activities more as he grows. Set up reading stations throughout the house. Don't keep all the books in one spot. Have a basket of them in the rooms where you spend the most time. I have a basket of books in my son's bedroom and I have some on a shelf in the living room. This way, there's always books close at hand. He's more mobile now so he won't sit still like he did before. So, if he's in a cuddly mood and sitting in my lap, chances are that we are reading. What we've also been doing is keeping a few books at our dining room table. It's not always possible when I'm trying to eat and feed the baby too, but I try to read him a story or two if it's just him and me sharing a leisurely weekend lunch or breakfast. I'll often get through two or three stories during breakfast and lunch on Saturdays! Don't break the bank on books. Most of my books came from my aunt who scoured thrift stores for us. Check out thrift stores to get your own collection. We don't have many good ones here so to fill in the gaps, I get a big bag full of picture and board books for my son at the library any time I'm nearby. The bag lives in the living room and I make a stack elsewhere once they're read so I know to return them. I love the idea of book stations! Neat way to promote early learning and create sweet memories! It's good to rise kids and show him the benefits of reading! That's what I'm hoping for too. My siblings and I were usually several reading levels ahead. It did make finding age-appropriate topics but challenging books hard to find. If I was in 5th grade, an 8th-grade reading level summer romance novel wasn't really in my interests at that point! Reading with kids can be fun too and builds in them an healthy habit. Such a great post! I don't have kids yet. But I plan to start reading to them at an early age. This is truly so important! Love the idea of taking them to the Library! I totally agree. We have always read to our sons. Reading to the baby from inside the womb plays a vital role in how he or she may react to it after birth going on into toddler stage. Reading builds charter and broadens their little minds. We as adults should read more too because when our children sees us reading, it will impact them in some way. Thanks for sharing. I loved this. Great article with good tips for early literacy! So critical for brain development! i totally loving this. in this age of time where kids usually carry ipad or smartphones, its still best to start them with physical books and reading rather than watch youtube or play games in ipads. I'm very passionate about literacy so I love this post! You can also start a book exchange club with other parents. That really helps cut the budget. I don't have any babies but I know people who do and most of them all read to their babies for the same reasons you've mentioned. I know my one friend asked for books insted of cards for her baby shower and she got over 100 books! some duplicates but she either exchanged it for another or re-gifted the repeats. I love reading and try to get my toddler to sit and listen to stories. He is a restless ball of energy so it takes a while for him to get involved.